THE MISTAKES THAT MAKE YOU HONEST — Seventeen Saddle Co Inc.
As a young girl, I was always bold and ready to make the "sale". I was business savy early on in my life. I owe this to my Grandfather. He is my mentor, starting off with little to nothing. He made his way to becoming one the most successful radio DJ's in Canadian history. A few years ago, he had the privilege of being inducted into The Radio Music Hall of Fame. Through the years his success was built buying small or failing radio stations and transforming them into successful stations. With all intentions of selling and moving onto the next project. My parents also successfully entrepreneurs. Building two Tim Horton's franchises from the ground up. Leading into #1 in sales in western Canada lasting for over 7 years. BUSINESS IS IN MY DNA. One day it just hit me. I was around 7 years old and I was feeling like I needed to make some cash. So I decided to paint all my parents firewood. Then took the trip around the neighborhood door to door. Using my blond hair and blue eyes, I sold it piece by piece. Well in my eyes I was rich. That was until my parents found out they were out of firewood. In my early teens, I thought I should get started in some more serious business ventures. I began collecting toonies in my lemonade jar. I went to the auction and purchased my first sales project pony, Apollo. Picture a rainy day... Myself and friend Kristina decided today's the day! So Kristina suited up in her bright yellow rain suit. I am holding him, we count to 3, she hops on and BAM! She's bucked off. INTO A HUGE MUD PUDDLE. So we try again, count to 3. BAM!! lands in the same mud puddle! After proper time and training, Apollo was started and went lovely under saddle. You just can't rush a good thing. Since I was young, I was in pony club. An eventer at heart. Always bringing along the next thoroughbred off the track. Until I fell in love with Woody, the Clyde X TB. My 3 Day Event coach Chelan said he was just too big to do the upper levels. We were schooling over 4"6" in Show Jumping and Dressage was always our strong suit. However, asking him to compete at the upper levels would be to difficult. Melanie competing on Woody in a Dressage competition. After taking a working student position in Ireland with an international Three Day Event rider. I returned to BC, and broke a vertebrae in my back. EVERYTHING GETS PUT INTO PERSPECTIVE. After all was healed, I focused in on dressage. Heading east to Ontario! I decided to lease an equestrian center. 24 stalls, indoor and outdoor arenas and huge paddocks with shelters. Now this is when you see the many varieties that come out of the wood works! I never realized why my dog would stay so far away from some but come straight up to greet others. Wow she could read people, I wish I listened to her! One boarder, would print out the 7 day weather forecast, post it on the door, write out what blankets were required for each day and call to check up hourly. Another boarder, fell off her horse in a lesson, she was 12. Her mom was yelling at her to get back on saying it would ruin her career if she kept crying! I HAVE A LAUNDRY LIST OF AWESOME STORIES! I love when potential boarders come in and say, I have two horses.. Can I have a multiple discount? HOW DOES IT COST ANY LESS FOR TWO HORSES THAN IT DOES FOR ONE? Then the landlord decided it would be a great idea to raise a huge coverall next door and fill it with sheep. Wow do sheep smell and boy are they loud. 3 years was enough for me! I give all barn owners, managers and staff a lot of credit for all they do! It is not an easy job! The saying "One bad apple, spoils the bunch" sure is true when it comes to boarding. I ALWAYS WANTED TO BE A VETERINARIAN. I had an opportunity to apprentice in saddlery and to become a certified saddle fit technician. It was definitely not the same line as veterinary medicine but I was up for the challenge. Working with leading riders, exceptional veterinary and alternative therapy professionals and of course great clients was definitely great perks to the job. My job provided me with education in depths of the saddlery trade, horses anatomy and very unique areas of the equestrian industry. Traveling throughout North America, developing new sales/service areas and attending international horse & trade shows. I truly felt like I was a part of something. Until situations started to change in ways that were going against my beliefs. The company had always manufactured their products in house, however, they decided to start outsourcing their manufacturing to India. Saddles were far below the gold standard of production. Something that was strongly against what I stood for. I had a very hard time coming into work each morning. I was selling high end products to my clients with expectations of quality. Who thought that their saddles were made by masters, in a certain workshop. Except their saddles were being made in a third world county, piece by piece, sent to the shop in boxes similar to pizza boxes. While many of the Master Saddlers had been laid off, minimum wage workers hired to piece together the saddles in the workshop. My clients were paying $5000.00 to $7000.00 plus taxes. I just could not stand by and lie. Clients work hard for their money, and deserve to get what they pay for. The final straw for me was when one of the directors of the company said "We should be proud of our company, we are one of the only factories in India that has a cement floor for our workers to stand on". I was literally sick to my stomach and almost walked out of the meeting that second. I was stuck. I sat in my truck crying to Jeff, my partner. I absolutely loved my job, my clients and many of my coworkers. I loved making a difference in my clients lives. I loved meeting new people, going to the horse shows and making people smile. The last trip I was on, I was with the president of the company, we were sitting in this little hotel in Minnesota after a long day of fitting. 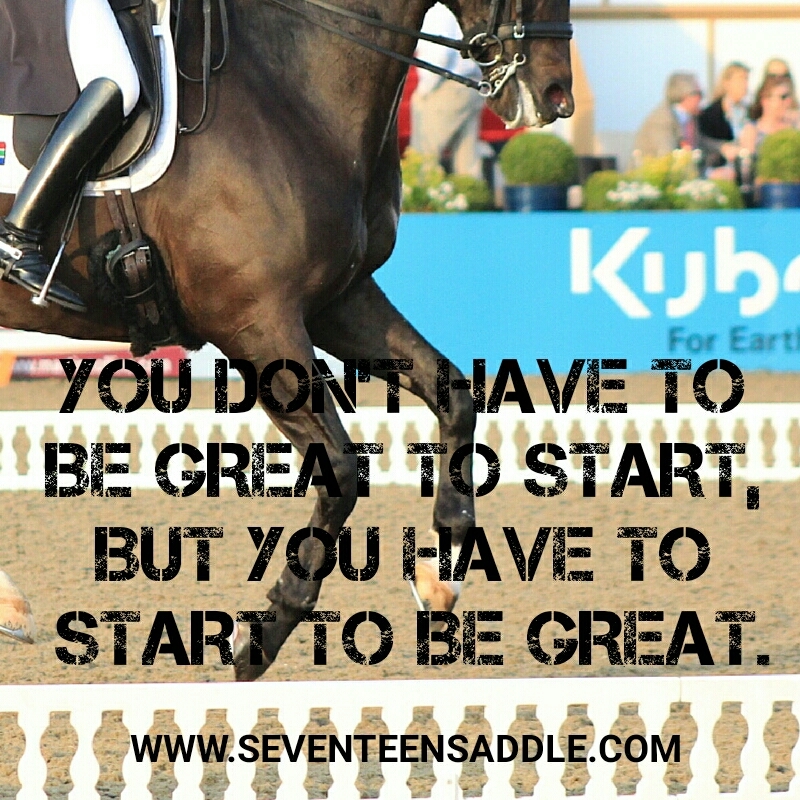 He was working on a huge sponsorship deal with an international FEI Dressage rider. While at this little bar, over a drink, he said "Melanie, I never wanted the company to go in this direction, I was happy with the small shop, helping the local riders and the quality of the products we made. I have been pushed into this direction of developing into a huge company". I felt for him, I saw the exhaustion. When you have this dream for your company and then when others take a hold of it, you say yes and it goes in a direction that you may or may not see fit. When I returned, we had been called in for a sales meeting and were told we had to make 70,000.00 by the end of the week. IF we did not the remaining Master saddlers would be laid off or worse the doors would close. So as sales reps, we needed to call on all our clients and let them know we were having a 10% off sale. I felt frantic, I made about $20,000.00 that week. I woke up in the middle of Thursday night and realized what I had done. There was the chance that the doors could still close and that my poor clients could be out of their money. I felt as though I stole from my clients. A few weeks later, I was in my office and was called up stairs. The president and sales manager was in the office. They had two papers on the desk, a new outrageous sales contract that took away many of my rights or my resignation papers. I had until the end of the day to decide. This was after 26 days on the road and 13 airplanes I flew on in just that month. My sales manager said to me "Melanie, it is best for us both if you sign this new contract or I will have to learn to fit and take over your territories" I walked out of the office and she followed me. Which in the parking lot, I told her what I thought of her. I decided to leave the company. I took the summer off to clear my head. Problem was I had clients who were in desperate need of my help. To be honest, I missed fitting. Out on the road I realized I needed saddles. When clients saddles were not suitable, a solution was necessary. I ended up partnering up with a company. After revamping some models and designing new models; I was able to offer a new European brand to clients. This was a great success for quite a few years. Until the brand lost its main production manager. Causing many issues in my business. After years of business I was being lied to. I RELIED ON THIS COMPANY - BUT MOST IMPORTANTLY, MY CLIENTS RELIED ON ME. I lost my credibility to my clients. I felt like my world was crashing in. I did damage control through refunding clients, fulfilling as many orders as I could and then ending the business relationship. It caused huge financial and personal stress and tainted my name within industry. These opportunities gave me the chances to work with some great master saddlers. Gaining the knowledge and courage to craft my own brand. One valuable lesson learned, do not invest all of your dollars, blood, sweat and tears into someone else's brand. This all builds their brands awareness within the industry. This is your precious time and fortune in which you will never get back. I started from the bottom. I worked with the top individuals that could help me build my own saddle brand. Most saddle companies purchase saddle trees from a handful of tree manufactures. Almost all saddle brands in North America and Europe are only different through the outer saddle design, the saddle tree's are stock. This was not the case for Seventeen Saddle Co. Investing in your own saddle tree molds are costly and take time. Our design team included a Swedish engineer who used high tech 3D equipment to design the saddle tree, the top North American mold maker to manufacture our saddle molds and a premium stainless steel production company to produce our gullet plates for optimal strength and to eliminate corrosion. All of the materials are above the gold standards of saddle manufacturing. At first, I hired a Master Saddler who made all our models in England. I learned very quickly that I needed to expand my team of saddlers. Seventeen Saddle Co. has grown to have offices in both Canada and England. I have been fortunate to be in front of some of the top horse and rider combinations, caring for their backs and saddles. Providing optimal freedom and clearance for these combinations to perform at their best. Representing their countries at top international events throughout the world. Over the years I traveled across Canada, been to almost every state in the USA, and Germany, England, Ireland, France and Holland fitting saddles. YES I HAVE EVEN SADDLE FIT IN OAHU! Lanikai Beach - This is the Ocean where Jeff and I got engaged! Pretty Awesome! Jeff usually does not jump when I tell him I am off to work. But when I told him I was booking a flight to Honolulu, he was in! After 10 years together, I guess taking him to a private beach house for a week to celebrate our anniversary deserved a ring! He even came saddle fitting with me!!!! NEVER BUY SOMEONE through YOUR PRODUCT. Early on in my career a fellow equestrian business woman once told me "Never give your product away for free. It cheapens the value of your brand, if top riders see value in your brand they will pay". For years, I never listened to her advice. I always felt the need to sponsor professional riders to help promote the brand. In a few cases, they did appreciate the sponsorship and worked with me to develop the brand in which I appreciated. In many cases, I found many did not work exceptionally hard at promoting and/or developing the brand and costed the company more money than it was worth. I do feel that you can work with professionals in a business relationship, however it does need to mutually benefit each other. MY PASSION. To help horses and riders find optimal freedom and clear communication. MY FIRE. Designing and developing the next new product. Our mistakes we have made do not define us. They do not follow us into our next journey. REMEMBER TO FAIL FORWARD. Keep moving and aim towards the next venture in life. Never be afraid to start something because of the fear of the results. I have had many fears in my life of starting, However, I have always trusted in my ability and my love for the horse. We will always trip and fall, It is just a matter of getting back up. Who cares about brushing yourself off, we are horse people! A LITTLE DIRT NEVER HURT NOBODY! My story today, is to give you a glimpse at Melanie. To guide you through all the twists and turns, be honest with you on my mistakes, how hard I have fallen, gotten up and kept going even when others doubted me. Trust me people still doubt me, but I don't care. We all have it in us to win. Older PostARE YOU TOO FAT TO RIDE?